With their beautiful metallic green coloration, large size (more than 1 inch or 2.5 cm long), and loud, buzzing, bumblebee-like flight, Figeater Beetles (Cotinis mutabilis, formerly C. texana) are some of the most conspicuous beetles found here in the Sonoran Desert. Adult Figeater Beetles emerge in the summertime, and they are especially common during the wetter, more humid summer monsoon season in July and August. In July of 2007, I used a mesquite bean to rescue this lucky Figeater Beetle out of a Tucson, Arizona swimming pool. The Figeater Beetle remained perched on the mesquite bean just long enough for me photograph it before it took flight and disappeared into the trees. The Figeater Beetle must not have been in the pool long before I found it because it certainly didn't need much time to dry off. For some reason, perhaps because of their somewhat clumsy, bumblebee-like flight, Figeater Beetles have a tendency to fly into swimming pools, and I'm always having to fish them out. Although they can look a bit drippy and waterlogged, I've found that these pool-rescued Figeater Beetles are the easiest ones to photograph. Unless they are feeding, Figeater Beetles are usually seen in flight and are thus quite difficult to photograph. Tumbling and bumbling around in a metal dog bowl, these other two pool-rescued Figeater Beetles below took a bit more time to dry off before finally flying away. Figeater Beetles are a matte metallic emerald green above with broadly tan to yellow-edged elytra (wing covers). 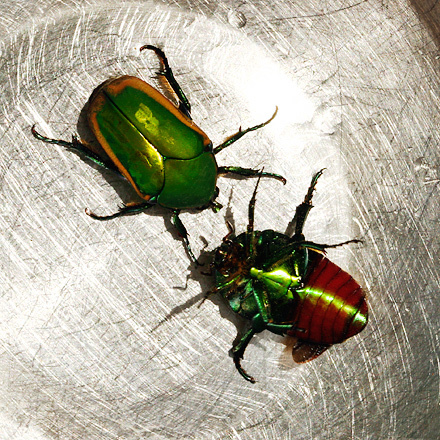 Below, Figeater Beetles are overlaid with bright, shiny green iridescence. Green June Beetles (Cotinis nitida) look very similar, but they are mainly found in the eastern half of the U.S. and have noticeably browner and bronzier green elytra. Figeater Beetles are members of the Scarab Beetle Family (Scarabaeidae), and they have the classic scarab shape. However, unlike many other scarab beetles, which are drably colored and nocturnal, the colorful Figeater Beetles are active during daylight hours. On hot summer days here in the Sonoran Desert, Figeater Beetles are most often seen buzzing around in the branches of Velvet Mesquite (Prosopis velutina) trees. Adult Figeater Beetles enjoy feeding on the sweet, black sap of Velvet Mesquites, and since these desert trees are abundant here and will readily ooze sap with even the smallest injury, they are a good food source for Figeater Beetles. 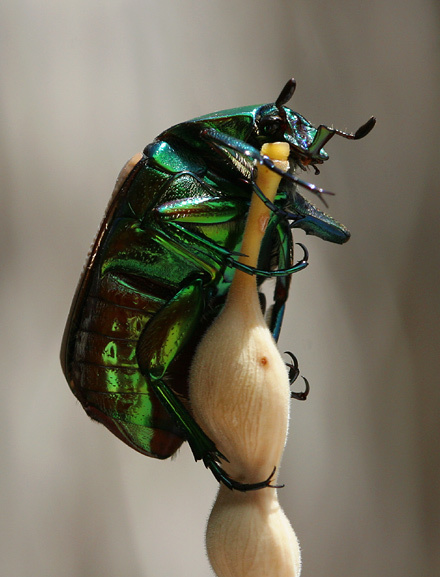 Unfortunately, Figeater Beetles are not only fond of sweet tree sap, they will also chew into nectar-filled flowers and feed on a variety of fruit, making them a pest. 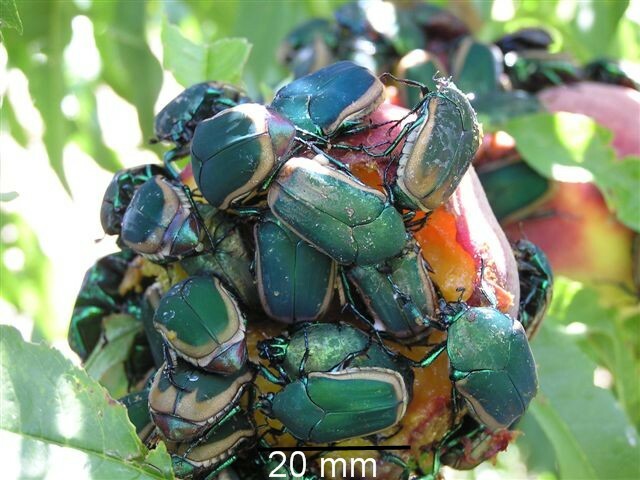 Although Figeater Beetles can be found feeding on many types of bird-damaged and over-ripened fruit, they are only able to chew into and damage softer, thin-skinned cultivated fruits like figs, peaches, apricots, nectarines, plums, grapes and native fruits like those of Saguaros and Cactus Apples. The best way to control adult Figeater Beetles is to cover, screen, or remove the manure, compost, thick mulch, or heavy leaf litter that provide food and shelter for their larvae. Figeater Beetle larvae are fat, white grubs, and since these plump morsels are absolutely adored by birds, any unearthed grubs will quickly be snatched up and devoured by them. I've never had a problem with Figeater Beetles eating any of the cultivated fruit in my garden since birds always get to it first. The only real problem I've had with Figeater Beetles (besides their fatal attraction to swimming pools) is with their bumbling flight skills. Figeater Beetles are heavy, plump, and not very maneuverable in flight, so if you step into their flight path, these buzzy bumblers will collide right into you. I've had several collisions with them, and I once saw a Figeater Beetle fly into a girl's long hair and get all tangled up as it writhed around trying to escape (I removed the beetle for her). Fortunately, Figeater Beetles are quite harmless and safe to pick up by hand. Also, since they are thick-shelled and quite tough, I've never seen a Figeater Beetle injured by one of these unfortunate collisions.